Celeriac, also called root celery, is certainly no beauty – but don't let appearances put you off. Beneath that gnarled and knobbly exterior lies a pale root, marbled with fine lines of green and brown. Its beauty is in its flavour – reminiscent of celery stalks but sweeter, more subtle, and with a peppery note. You can eat it raw, but it needs to be blanched to be included in salads as it discolours after peeling. For a classic French remoulade, it is grated and married with mustard dressing, but it can also be sautèed, steamed, boiled or purèed, and enjoys a squeeze of lemon juice or a grind of nutmeg. For a more mellow flavour, partner it with potato for a creamy mash. Ideal for slow cooking, it can be used instead of swede in casseroles, or diced, tossed in olive oil and roasted to intensify its flavour. Enjoy the fresh flavours of this creamy celeriac mash with the richness of pan-fried duck breast. 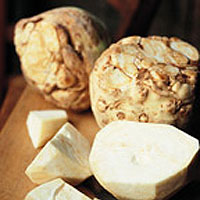 Using a sharp knife, remove the outer skin of the celeriac, then cut into chunks. Place the celeriac and potatoes in a large pan, cover with cold water, bring to the boil, then cook for 15 minutes or until tender. Meanwhile, using a sharp knife, score the skin of the duck breasts in a lattice pattern. In a large preheated frying pan over a high heat, cook the duck skin side down for 5 minutes to brown, regularly pouring off the fat into a bowl. Season and cook for a further 10 minutes, turning halfway through, until the juices run clear. Remove the duck breasts from the pan and allow to rest in a warm place for 10 minutes. Meanwhile, drain the celeriac and potato thoroughly, return to the pan and mash together with chopped parsley, lemon juice, 1 tablespoon of the olive oil and seasoning. Toss the watercress in the remaining olive oil and season. Slice the duck breasts. Serve the celeriac mash on warmed plates with the dressed watercress and the slices of duck, spooning over any juices from the pan.